Are you manufacturing greenhouses for local or international markets? 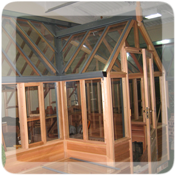 Let us help by contacting the Probyn Export team and letting us send wood that’s ideal for the construction of high quality greenhouses and garden houses that look great outdoors. We have extensive knowledge of the best wood that will match the standards of your customers' expectations.